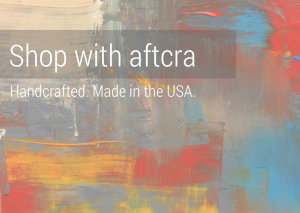 The aftcra Blog – Handcrafted Goods. Made in America. Get the latest news from aftcra. Below are the latest posts and biggest updates. Get Ready – the 2016 Christmas Gift Guide for Him is here! 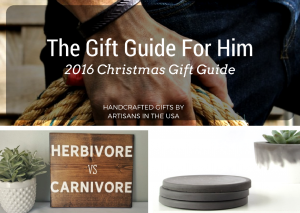 Spice up your gift giving this Christmas when you’re buying a gift for him, and let us help you find a gifts that matches his hobbies, personality or your love for him with this list of unique Christmas 2016 gifts for him. 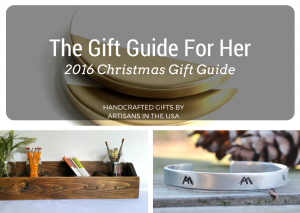 It’s Here – the 2016 Christmas Gift Guide for Her has arrived! Get out your wallet and prepare to fall in love with our 2016 Christmas gift guide for her – full of beautiful handcrafted gift ideas she’ll absolutely adore. Check back often as we continue to add suggestions to the list. 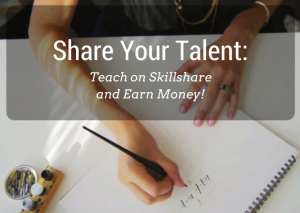 Share Your Talent: Teach on Skillshare and Earn Money! Learn about becoming a teacher on Skillshare, where you’ll build your brand and reputation as a crafter while earning money. If you publish a class by September 30th, you’ll be eligible for a $100 cash bonus. Import Your Etsy Listings to aftcra in a Flash with aftcra’s Etsy Importer. 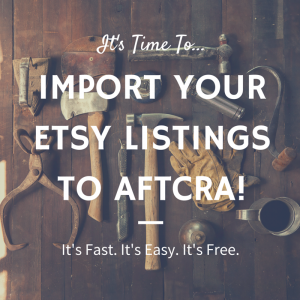 Import your handmade Etsy listings to aftcra quickly and easily without the hassle of having to upload each individual product with aftcra’s Etsy importer tool. It’s Fast, easy and free! Shop Made in the USA with aftcra! We love supporting local American artisans, and you should too! We share why we love American made goods and shopping locally. We want to re-commit to promoting only handmade goods and share our handmade guidelines. My website is being redesigned on my own domain (dmbfashions.com) which should be completed by early April. I began my business over a year ago as Just4CrochetDmB, making FreeForm Crochet women’s outerwear (vests, capes, wraps, & stoleNhoods). I navigated your website quite easily, and with excitement! A friend shared an Business News Daily article with a your site link. The products (clothing) I see on your storefront are great in variety, the photographs very nicely done. It sure would be nice to see higher end fashions made by hand. Are you planning for a future section to include incomparable handmade clothing? If so, I’d be interested in joining you. Baukat Couture came about when one of my customers joined me as a partner, offering beading to embellish my designs (purchased and new sales) as options. It’s been only six short weeks of our collaboration, and we are developing new products to our ready-to-wear items. My goal is to create unique, high fashions in outerwear, for the select group of buyer who want something only they will ever own. Customer specifications and their satisfaction is my personal promise that no two Baukat Couture product will look the same. Let me know, please, what your thoughts are for a dedicated section for the discriminating shopper. I am trilled to have found a hand-crafted in America ONLY web site to retail my jewelry. The site looks awesome and it is very easy to set up my pages. Thank you aftcra team! Hi Debra – Thanks so much for the note! We are happy that you enjoy it and found it easy to use. Looking forward to working with you! I am thrilled to have my wearable art jewelry pieces here. Etsy is not artist friendly anymore. So man other sites hurt the artist with huge fees. This is THE BEST site out there for American Artists! Thanks Renee! We are so happy to have you with aftcra. I am diversifying my sales potential my finally importing some of my Etsy products over here. 🙂 I will be adding more items over the next few weeks. I have been with Etsy for a couple of years and have only sold a handful of items. I am hoping that Aftcra will be a better fit. i am glad i found this site for Made in America Handmade items. so far so good i love this site. I am absolutely thrilled to see the addition of a CSV importer! I started my account quite a while back, but the task of adding over 100 products to my shop, one at a time, seemed impossible. Now, with an importer, it’s much easier! Thank you for adding that, and I’m very much looking forward to working with the Aftcra community further! I am very happy to join your site. I have been committed to American craft since 1982 when I opened my first gallery, The Wildflower in Coronado California. Expansion brought be to The Old Ferry Landing in Coronado where I built and opened The Bayside Gallery which i later moved to Seaport Village in San Diego. My fourth gallery was on Balboa Island in Newport Beach. I represented over 100 american artists specializing in hot glass, jewelry, pottery, woodwork and paintings. I developed my own line of jewelry which I also wholesaled to like galleries nationwide. I have been retired for several years now and I am happy to be designing jewelry again. I look forward to exercising my creative ability. Thanks for providing me this theater. I am so happy Aftcra specializes in handmade items. I am a jewelry designer and I really like to be in a marketplace that is only for designers and original made items. 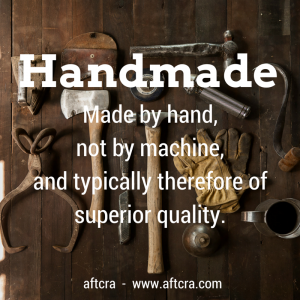 Handmade items are unique and are not compared to machine made products. Thank you, Cat! We love working with such talented makers 🙂 Thanks for the kind words! Visited several shops within my trade and most have no listings and those that do have listings are showing not available. Is this venue still active or has it gone by the wayside like so many others? I am a Master Leather Craftsman with over 40 years of experience in this trade and would consider this venue if still available. Hi,So far so good just joined easy to navigate and set up would like to have a sporting goods category for my product and others who are outdoor minded.Is it possible ? Hi Gary – thanks for the note. Unfortunately we do not have a sporting goods section, but you could put your products in the “Accessories” category and perhaps we will add this category soon 🙂 Thanks Gary!